The 38,000 sf project included nine newly added classrooms, a media center, and new administrative space, a covered drop-off and pick-up area as well as the addition of new parking lots. Both projects are wood frame construction with stained wood and natural stone exterior and asphalt shingle roofs. The interiors are a stained wood finish for walls and ceilings, with stained concrete, ceramic tile and carpet flooring. Both buildings were constructed within 12 months, during a year of abnormally wet and snowy weather. MarketPlace Grill is a unique construction project involving complicated architectural design, precise, inflexible placement of gas, plumbing, and electrical elements, and a tremendous amount of high finishes. Through teamwork from all involved in this project, MarketPlace Grill was completed on an extremely tight five month time schedule, in budget and without any loss time accidents. SSi Incorporated is a full service construction firm that has built a reputation and long term success on the strongest of foundations – our on-going relationships with our valued and satisfied customers. SSi was founded in 1969 by its President, Leo Anhalt, and has been in full, continual operation for over 45 years. 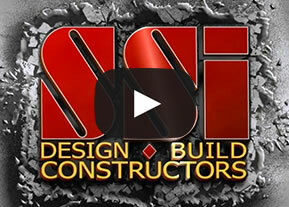 SSi provides design/build services, pre and post construction services, and construction management services. Welcome to our website. 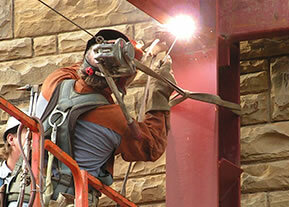 SSi has a great experienced team of professionals ready to serve our clients.